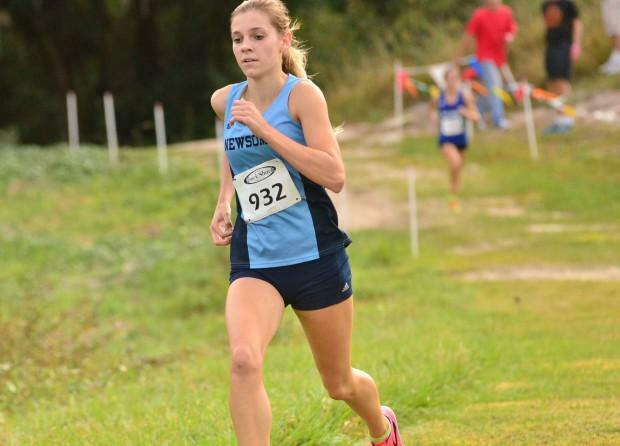 At the 2017 Hillsborough County Cross Country Championships in Tampa, Newsome senior and Indiana-commit Bailey Hertenstein did not take first place. It snapped a streak that extended back to her freshman year. She was overcome by Riverview sophomore friend and rival Alyssa Hendrix on an off day where she was bitten by stitches (cramps). Since then, she has been back with a vengeance...and then some. Hertenstein hit back with a 17:48.25 to beat Hendrix at districts. On Friday, Hurricane Hertenstein hit Holloway Park with Category 5 force. 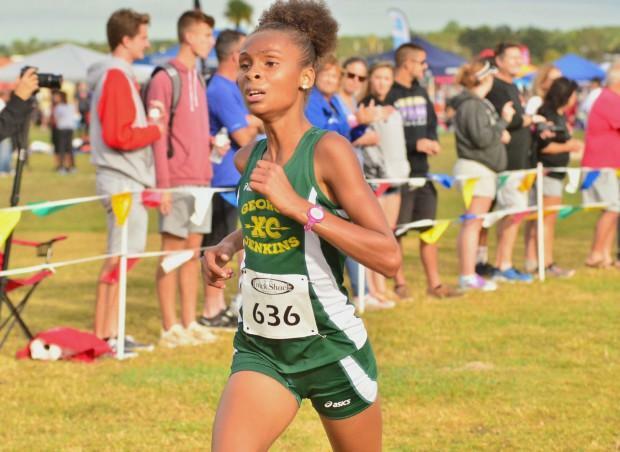 Hertenstein already owns the course record at Holloway, an 18:10 from the Flrunners Invite in September. Hendrix also has one of the top times for the course from that meet. As the 4A race went off, both runners moved to the front of the pack. By the first mile, Hertenstein and Hendrix had already separated, putting an 11-second gap between them and the rest of the field. The battle between them ensued on the back trails and it would be Hurricane Hertenstein coming out near the three-mile mark, with an eight-second lead on Hendrix. Pounding away at the grass straightaway for the finish, Hertenstein was still under 18 minutes. As she crossed the finish, the time read 17:47.38. You read that right. Hertenstein demolished her own course record from just over a month ago by 23 seconds. Good luck touching that one. "County really frustrated me I was having cramps and it was just not fun," Hertenstein said. "I felt great for today's race though. It's my senior year and I want to enjoy it and make the most of it." Hertenstein now heads to states ready to defend her Class 4A state title for the third-straight time. Her biggest obstacle...is Hendrix. 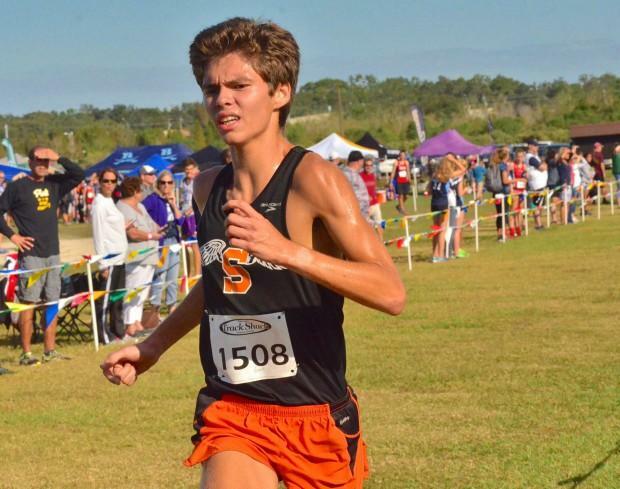 Hendrix ran a 17:56.85 which would have incinerated any of the other regional races on Friday. 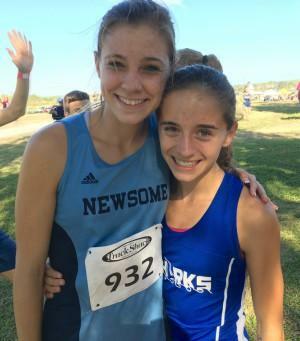 It's Hendrix's inspiration and burden that she has to run head-to-head with one of the greatest athletes in the state. "Bailey really pushed me and I knew I could get close," Hendrix said. "I wanted to go sub-18 and I knew I would have to find that third or fourth gear." The rivalry is almost a partnership between the two. "Alyssa is a really great asset," Hertenstein said. Beyond the two barn-burners, George Jenkins runners Anna Sentner and Alicia Ruiz made strong showings taking third and fourth in 19:00.15 and 19:04.80, respectively. It was a big finish for Jenkins' starting two and it helped moved them up into the runner up spot in the team standings. Amy Frisch grabbed 11th overall in 19:46.98 but it was not enough to hold off the Newsome Wolfpack. The Wolves are not a one-trick team. They've built a reputation for being pack runners and now they have a stud in Hertenstein. It would be the Wolves that won the team title with 65 to Jenkins' 104. Behind Hertenstein, freshman Keleigh Scallon slotted into eighth place in 19:27.75. Sophomore Emma Solis took 10th place overall. The Wolves are deep and they are young. 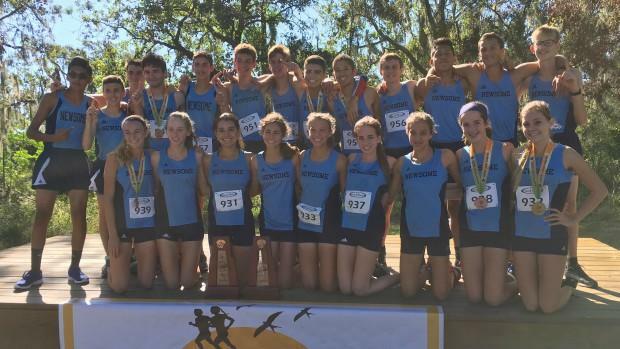 "We emphasize teamwork but having the number one runner in the state helps," Newsome girls coach Orlando Greene said. "This all started last year when we placed a disappointing 12th at states. By May, all the girls had bought into the idea of getting back to states." The Wolves were runners up at regionals the last four years. Friday marked their first regional title since 2008. 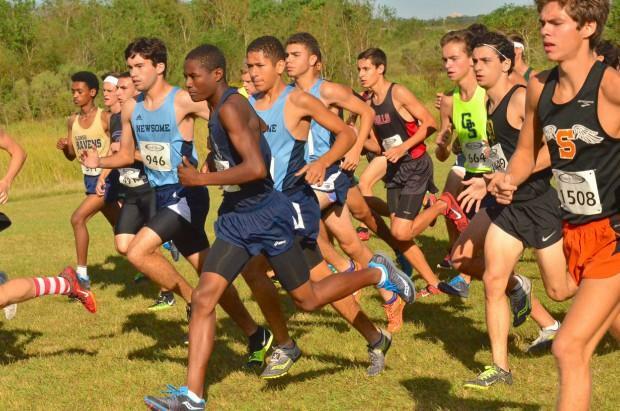 The Newsome boys squad made a big statement on Friday. The Steinbrenner boys had been the dominant force in the county and beyond for most of the 2017 season. 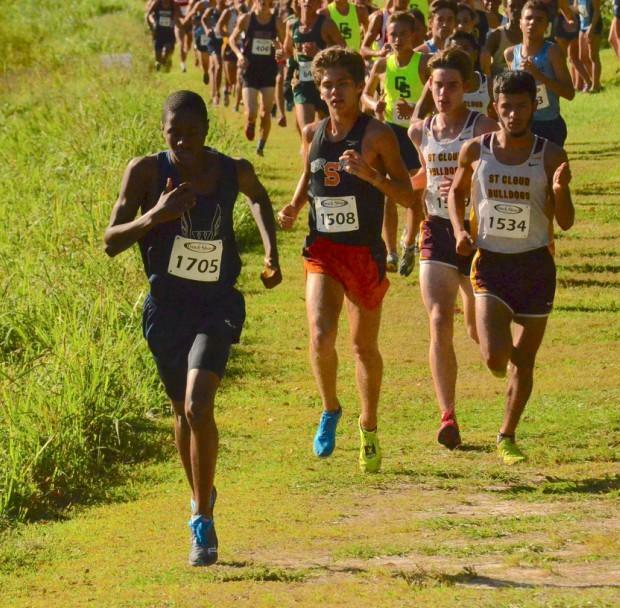 They were favorites at the 4A Region 2 race on Friday. "We just wanted our top three to be in good position with theirs," Newsome boys coach Brian Sears said. "We talked all week about getting close up to the lead pack but there's no way I though it would be that close." It wouldn't be until the eight place but at 16:48.43 the first Newsome runners started coming in. Alex Bugielski was the first. Next was Chris Pinedo in ninth overall at 16:53.50. A few places back in 14th was Dominic Acosta. Bugielski, Pinedo and Acosta would end up finishing in front of all Steinbrenner runners but the Warrior pack mentality came in strong. Jackson Miller was the first Warrior to come in at 17th overall but then the Warriors just poured into the finish line. From freshman Zachary Harrington to Gabriel Lara, the Warriors grabbed the 19th to 24th spots overall. Seven runners across the finish in the race's top 24. The Wolves earned it but were fortunate. The Warriors remain a potent threat for the state meet, as do the Wolves. "Our back pack ran better than they've been running," Sears said. "Four to eight train as a group and out one through three all did a great job, too." It marked the first regional title for the Newsome boys in school history. In Sears' seven years, they've been runners up three times. Individually, the race was a great one to watch. Favorite Benjamin Hartvigsen led the charge up the first hill, just after the start. Through the first mile, Wharton's Nehemiah Rivers worked into the lead of a very tight group with Hartvigsen and St. Cloud's Tristen Montavlo and Zachary Cloud. As runners vanished into the back trails, Hartvigsen made his move. "Tristen was still on me right up to the two-mile mark," Hartvigsen said. "From there, there were a lot of turns and I was able to work those, pull away and push push push, trying for that sub-16." When Hartvigsen came out of the trails, near the three-mile mark, he had stacked a 22-second lead on the group and the sub-16 was almost within reach. Hartvigsen would win it with a 16:04.84. Montalvo would take second in 16:22.20. Lakewood Ranch's Jonathan Reid moved up into third at 16:27.13 and Wharton's Rivers held on for fourth in 16:35.75. That sub-16 is still in reach for Hartvigsen. He loves the course at ARP and ran a 15:37 there at Pre-State. "This second one at FSU is going to be a big one," Hartvigsen said. "I want to try and prove it (sub-16s) can consistently happen."